The Alliance met with Steve Janke in 2018 and looks forward to partnering with the Department of Veterans Affairs and other organizations on efforts to employ veterans. On August 24, 2018, Wisconsin launched a national campaign to encourage transitioning military personnel and their spouses to live and work in Wisconsin once they leave the service. 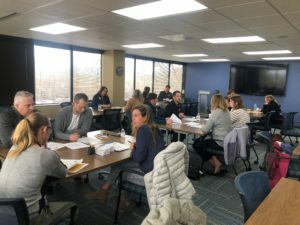 The new initiative—a joint effort of the Wisconsin Economic Development Corporation (WEDC), the Wisconsin Department of Veteran Affairs (WDVA) and the Wisconsin Department of Workforce Development (DWD) —is part of the state’s $6.8 million marketing campaign aimed at attracting talent to address Wisconsin’s current and future workforce needs. Wisconsin’s unemployment rate is at a near-record low and the state outpaces the nation in labor force participation. While that’s outstanding news, Wisconsin employers must work harder to find skilled talent to fill good-paying jobs. The Wisconsin State Legislature passed and former Governor Scott Walker signed into law legislation that is aimed at addressing Wisconsin’s growing workforce issue. This legislation targets three groups: millennials, alumni of Wisconsin universities and colleges and transitioning service members and spouses. The first two phases of this effort have largely consisted of targeted paid marketing campaigns. The third enlisted WDVA, DWD and WEDC to engage face-to-face with transitioning service members and spouses before or as they transition. Wisconsin is the best state in the nation for veterans’ benefits as recognized by the National Association of State Directors of Veterans Affairs (NASDVA), offering 23 of the 26 benefits available to veterans. Alongside WEDC’s “Think. Make. Happen.” marketing campaign, we want to leverage DWD’s employment case management abilities to inform those transitioning that Wisconsin is offering concierge-level case management services to those who choose Wisconsin to live and work. Through an initiative called Mission Wisconsin, the state has entered into a sponsorship with Hiring Our Heroes to engage with transitioning military and spouses at Transition Summits and hiring fairs. Hiring Our Heroes recognized that transitioning military and spouses needed a way to own their transition and have opportunities in place prior to separation. Wisconsin recognized that engaging with that demographic at or before their decision point was the best place for this groundbreaking program to reach and employ veterans. Service members and spouses who attend these events are anywhere from one week to two years before leaving the service, which allows Team Wisconsin to inform them of what Wisconsin has to offer. Team Wisconsin represents employers and the state as a whole at these events by leveraging the unique public-private partnership that has been developed through this program. The goal is to connect service members and their spouses with jobs before they leave military service and to help support them through their transition by connecting them and their families to resources in Wisconsin. This program provides a unique opportunity to inform part of the 200,000-250,000 members of the military that leave the service every year and raise their awareness of the quality of life, opportunities and benefits offered in Wisconsin. This marks the first time Wisconsin has embarked on a comprehensive national talent attraction campaign aimed at military personnel. No other state has developed and implemented a national campaign aimed at attracting veterans and their spouses. Furthermore, the initiative’s concierge-level case management services connect them not only to employment, but also to benefits, services and communities within the state. By offering the opportunity to build a talent pipeline with the hundreds of thousands of transitioning service members and spouses every year, the program connects the public sector to the business community. Utilizing the existing veterans organization community in Wisconsin, the program fosters collaboration at all levels to ensure that when service members and spouses transition, every possible connection to resources is covered. Moving forward, Team Wisconsin will continue to raise awareness of the program throughout the state and how it not only benefits service members and spouses, but all the partners across Wisconsin. Learn more and get involved at www.wedc.org/marketing/hire-veterans. Is it Talent Acquisition OR Talent Attraction? Congrats to Beth Lohmann, one of our 2018 Emerging Leaders of Waukesha County! Congrats to Ryan Rethwisch, one of our 2018 Emerging Leaders of Waukesha County! Foxconn in Wisconsin—What does that mean for Waukesha County? Congrats to Cindy Simons, one of our 2018 Emerging Leaders of Waukesha County! Congratulations to our Emerging Leaders of Waukesha County for 2017! Congrats to the 2018 Emerging Leaders of Waukesha County! Congrats to Steve Wurster, one of our 2018 Emerging Leaders of Waukesha County! Congrats to the 2018 Waukesha County Awards finalists and winners! Milwaukee Biz Blog: Will 2019 deliver ‘dark store’ solutions? Meet our 2017-2018 Leadership Waukesha County Class! Congrats to John Dunn, one of our 2018 Emerging Leaders of Waukesha County! Congratulations to the 2018 Don Richards Leadership Award winner! Congrats to Ryan O’Toole, one of our 2018 Emerging Leaders of Waukesha County!